ATLANTA — In a recent conference call, Tom Webb, Manheim's chief economist, discussed the bottom dropping out of the subprime mortgage market, saying there will be no similar trend occurring in the subprime auto lending market. "Let's face it, a lot of the subprime mortgages were what we'd call ‘stupid loans,' with no documentation of income, nor any realistic appraisal of the property," Webb said. "The subprime mortgage market is relatively new. This is their first real downturn. Subprime auto lenders have gone through several credit cycles, and they have learned from each one. "There has been no real-time correction or penalty for pushing bad loans on the lender. On the dealership side, sure an F&I manager might every once and a while push out a loan which has minimal chance of repayment, but he will quickly make it up to the lender in short order," he continued. "F&I managers and auto lenders know that they must work together and they have to develop practices to ensure their mutual long-term success. For the most part, they have done that," he added. He described the subprime mortgage sector as going from "bad to worse." "Almost all of the lenders are trying to renegotiate funding with their banks, some have been forced to stop lending, and others (with more to follow), have filed for bankruptcy. Certainly, this will add further pressure to the sales decline in housing. After all, subprime is not an insignificant portion of the market. Trade sources put subprime mortgages at $650 billion, or 20 percent of the market in 2006, and up from $120 billion, or 5 percent, of the market in 2002. Additionally, the surge in foreclosures will add additional supply to the already large inventory of homes up for distressed sale. Based on this information, Webb said he can see why some auto industry watchers may look at the uptick in subprime auto delinquencies and conclude that industry may be headed under as well. "I think not," he highlighted. "Many of the subprime mortgages were simply bad loans and had no legitimate prospect for repayment. Auto dealers, unlike some mortgage brokers, would never pass such loans on to their lenders. "Dealers and indirect auto lenders have, over the years, come to understand that their mutual success depends upon cooperation and shared objectives - something that subprime mortgage lenders and mortgage brokers obviously failed to establish," he explained. "Additionally, there have been instances, (and more will surely be exposed) of financial shenanigans in the subprime mortgage market," Webb said. "Most important, the subprime mortgage market is new and has never gone through such a correction. Subprime auto lending has experienced several cycles and learned from each. 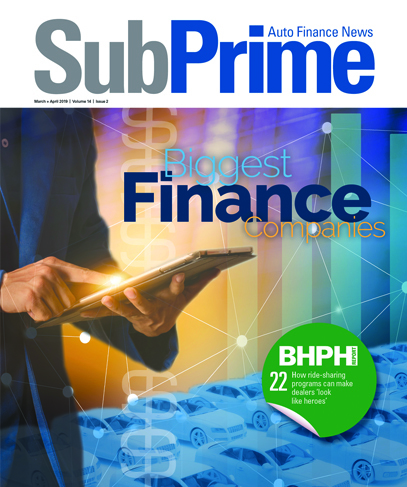 "Bottom line — expect an increased flow of repos into the auction lanes from subprime lenders, but no sharp curtailment in future subprime lending," he pointed out. "That's important because if those lenders do pull back, it will have an immediate negative impact on wholesale pricing, hurt the lender's recovery rates and start a downward spiral in the market." Tax season can mean big business for buy-here, pay-here dealers, and Webb said that this popular sales time has come earlier and earlier each year, with 2007 being no different. "Tax refund season is critically important to used-vehicle dealers," Webb explained. "Indeed, for dealerships selling into their lower price points, such as BHPH dealers, tax refund season can represent the majority of their annual sales. "Between January and April this year, approximately $215 billion will flow back to consumers in the form of federal income tax refunds," he said. "What makes this transfer of money so important to used-car dealers is that consumers often treat it as found money that should be allocated to something major. Given that most households are ‘cash poor,' tax refunds are the source for a down payment that they otherwise wouldn't have." As of early March, Webb said tax refunds reached $117 billion, up 6 percent from the same time last year. "The average refund this year has been $2,578, up 3 percent from 2006," he pointed out. "Since large refunds often distort the average, the impact of tax refunds on the used vehicle market can also be measured by the number of refunds. As of March 3, a total of 44.5 million refunds have been sent to U.S. households, an increase of 2 percent from 2006's pace." Webb went on to report that Manheim Consulting expects the full-year increase in tax refunds to come in slightly under 5 percent. "Still, that is a healthy gain," he explained. "And, as shown in the chart ... will represent a continuation of the trends towards earlier and earlier tax refunds. We estimate that nearly 53 percent of the total refunds that will be received between January and April 2007 were already distributed by the end of February. "In 1999, less than 40 percent of the total was distributed by the end of February," he continued. "Electronic filing, direct deposit and a greater share of refunds represented by the relatively easy-to-file earned income tax credit explains why funds are being disbursed sooner. To date, this tax season has seen 76 percent of all returns filed electronically. That's up from 73 percent in the same period last year." As consumers file their tax returns quicker and quicker each year, Webb said it pushes up the traditional spring retail used-vehicle market. "Indeed, for many dealers, the ‘spring' selling season is over before spring officially begins," Webb pointed out. "And, quite naturally, this has spilled over into wholesale pricing and auction activity. "Statistically, this is confirmed by the Manheim Index, where the seasonal adjustment factor for February shows it becoming an increasingly strong month for wholesale pricing," he concluded.